African American Storytellers are most familiar with the cowtail switch through a story that has been declared a requirement in a Black Storyteller’s repertoire. “The Cow-tail Switch,” as collected from West Africa by Harold Courlander, is a tale in which we learn that as long as we call out the names and tell the stories of our ancestors, we keep them alive. In the story, the child who earns the cow-tail switch is the one who inquires as to the whereabouts of his father after a long absence, as opposed to the other children who apply their talents to aid in the father’s return after he was found. The story brings to light ancient symbolism of the cow-tail switch, sometimes referred to as the fly whisk. Its significance has been deemed both authoritarian and spiritual. A King’s whisk upon the shoulder could mean a change of circumstance, and the Yoruba Orisha, Oya’s irukere (cowtail switch) is known to cause wide spread transformation through her forceful winds. Centuries old and laden with stories, the importance of the cowtail switch is legendary until this day. It was Raila’s turn next. Waving a black fly-whisk, he knew how to work the crowd. He demanded obedience and acceptance of his newly appointed ODM officials, those previously labeled Jubilee moles and rebels who were excelling in singing “Raila for president”. In total control, waving the black fly-whisk and singing “Mapambano”, Raila was the inheritor of Kajwang’s mantle. – Business Daily, December 8, 2014. 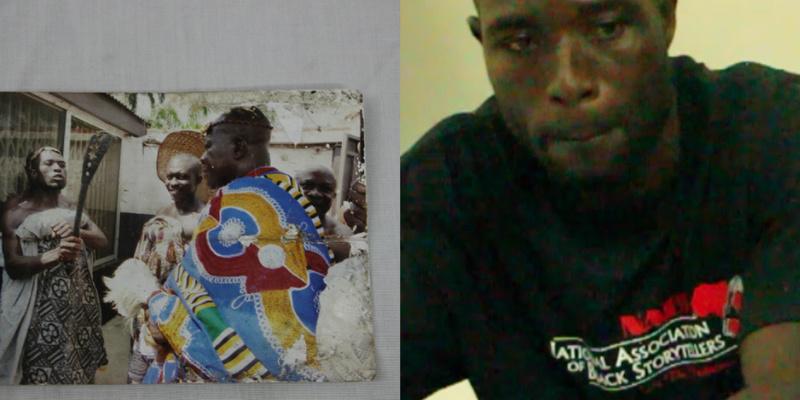 When visiting Ghana last May, I had the honor of interviewing, Nana Opoku one of the Asantehene of Kumasi’s protectors and orators. To the left you see Nana rendering all the names and attributes of the King while the Asantehene, Otumfuo Osei Tutu II, stands before him holding his symbol of authority – the white-tailed cowtail switch. To the right is a photo of Nana during our interview. Here in America, it is the National Association of Black Storytellers, Inc. (NABS) that carries on the empowering tradition. We continue, perpetuate and promote “In the Tradition…” the customs and rituals of the National Association of Black Storytellers, Inc. which are rooted in our African Heritage. Mother Mary Carter Smith, the co-Founder of NABS brought the cowtail switch to the NABS. During the 1980’s she used the cowtail switch as she told the Cow-tail Switch story. In 1992, the cowtail switch was ceremoniously bestowed upon the third president of NABS, Baba Jamal Koram during the 10th Anniversary of the Annual National Black Storytelling Festival in Baltimore, MD. Since then, it has been known as the “Passing of the Cowtail Switch Ceremony.” However, the cowtail switches were either borrowed or belonged to that President. Part of my quest while traveling in Ghana was to bring back a cowtail switch that would be the permanent property of NABS. But first, it had to be regaled to reflect its authority, prestige and prominence. The journey began in Accra where the switch was purchased. A few days later, I traveled to the historical bead market of Koforidua, where Yoseda Hasan helped me search for brass beads to symbolize our co-founders – The Sankofa (Mother Mary Carter Smith) and the Asante Stool (Linda Goss, NABS 1st President). Understanding the royal nature of the switch, Yoseda extended its handle. Upon my return to the states, the switch was shipped to Pittsburgh, PA where Temujin Ekunfeo masterfully beaded the switch using red, black and green glass beads to represent the national collective consciousness of our people and cowry shells to exemplify wealth. Butterflies were added in memory of Brother Blue (Hugh Morgan) and to symbolize the transition between presidents. The esteemed switch received its distinguished finishing touches from Nashid Ali of Philadelphia, PA, who jeweled NABS brass acronym and logo. Honor: Honoring the incoming President and giving him/her the authority to preside over of the NABS’ Board, and to represent the organization, as witnessed and recognized by the membership of NABS. Respect: Honoring the collective works and continuing efforts of the NABS association family, including contributions by the elders and ancestors. Remembrance: Remembering our ancestors: “The ancestors are alive as long as we remember to tell their stories. It is a great honor to be the bearer of the National Association of Black Storytellers’ Presidential Cowtail Switch. 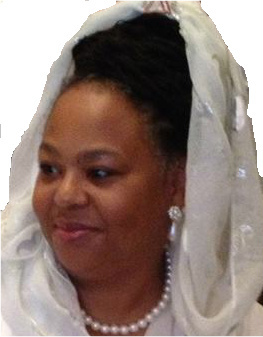 Karen “Queen Nur” Abdul-Malik is the 14th President of the National Association of Black Storytellers, Inc. and a lauded National Storyteller, Teacher Artist and Cultural Worker with a Masters in Arts in Cultural Sustainability from Goucher College. She is the winner of MidAtlantic Artists-As-Catalyst Awards, NSN Brimstone Grant, and featured in the book Legendary Locals of Willingboro. She is the founder and executive director of In FACT, Inc. , a cultural sustainability organization. Resources: Cowtail Switch and Other Stories by Harold Courlander; Business Daily; Smithsonian Institute Collections; Look for Me In the World Wind by Makeda Kemit; The Yoruba Religious Concepts.